that Nurtures Flowers and Vegetables. Leading Company HYPONeX Japan Corp.
During the turbulent period after World War II, attention was drawn by the founder of our company to “Hyponex Powder” a chemical fertilizer developed in the United States and sales of this product was released as the product for the coming generation. Since that time focus was not only placed on consistent product quality but products in demand of the era were also imported and developed to satisfy the needs of the people. We have long enjoyed the #1 position and today we maintain the #1 market share in the home gardening fertilizer market. This was made possible by the patronage and support of our customers for which we are deeply grateful. Presently, the lifestyle and housing environment have become diversified hence flowers and green which had once been the symbol of “beauty and an affluent life” is now changing to become a “part of life”. We hope to maximize the knowledge accumulated through our experience to home gardening, production of ornamental flowering plants, furthermore, in new areas of golf and sports field and others, actively providing wide range of supplies and technical assistance. Simultaneously, we will attach importance to the globalization of our company. We intend to provide guidance for good cultivation technology in the Asian countries as we so wish to assist in quality and productivity improvement. The environment surrounding business in Japan is definitely not rose-colored. No doubt our goal is the #1 post in the total home gardening field nevertheless we shall make our best effort with different approaches so we can add even just 1 person more who would sympathize with the joy of life with plants. We hope to receive your continued patronage of our products in the future. Hyponex Japan was founded in 1962 by Hirotaro Murakami under the name of Maruwa Chemical Company Ltd. In 1983, Maruwa Chemical Company Ltd. was renamed as Hyponex Japan Corp., Ltd. In 1993, adopting the will of Hirotaro Murakami, Yasutoyo Murakami assumed the post as president and C.E.O. of Hyponex Japan. Today the wide product range sold nationwide mainly through home centers and garden centers have grown very popular, trusted and loved by home gardeners. The company is making effort to continue growing further as a reliable corporation. 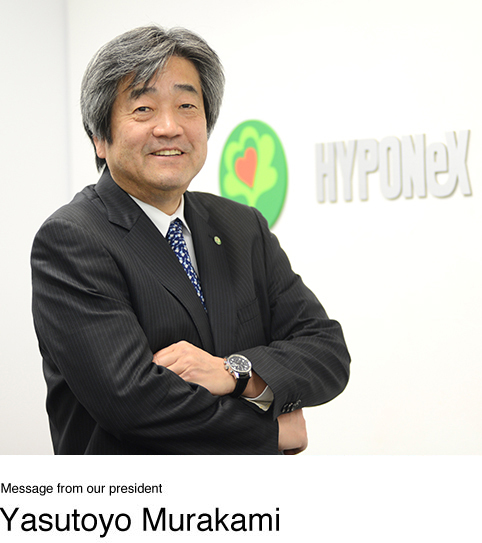 founded MARUWA CHEMICAL CO., LTD.
change of company name to HYPONeX JAPAN CORP., LTD.
Yasutoyo Murakami took the position as President & CEO of Hyponex Japan. Hyponex Japan provides products that can be divided into 4 categories. They are Consumer products, Professional Grower products, Golf & Sports Turf products, Medical Testing Kit. The flagship products of the company is consumer products , supporting gardening centered around fertilizers, media, chemical and other gardening products. We are aiming for the globalization of the company, expanding our marketing network not only to home centers and garden centers in Japan but also in South East Asia. Copyright©2000-2019 HYPONeX JAPAN CORP.,LTD. All rights reserved.